Easy Bánh Mì Thịt Xá Xíu with pickled vegetables, chiles, cilantro and a quick stove-top char siu (Chinese barbecued pork). As my list of sandwiches grew, I realized that it wasn’t sandwiches I disliked, it was the boring sandwiches I’d grown up eating. You see, the thing that always bothered me about the sandwiches I’d eaten was that they were all so one dimensional. A ham and cheese sandwich is just salty, while a peanut butter and jelly sandwich is just sweet. But all it takes are a few tweaks to either and you have awesome sandwiches like a Cubano or an Elvis. By the time I had my first banh mi in the Blossom Hill neighborhood of San Jose, I was a regular sandwich pro with a long list of favorites. But nothing prepared me for the goodness that is a banh mi. Perhaps it was the ridiculously low price ($1.50); or the impossible light, yet audibly crisp roll; or the harmonious cacophony of textures, tastes and colors that made each bite unique; or the way the well marinated meat continued to give up flavor the longer you chewed. Whatever the reason, one sandwich was all it took for me to be hooked for life. To do this day, Banh Mi’s are still my favorite sandwich, and they would probably make it into my list of 10 favorite foods of all time. 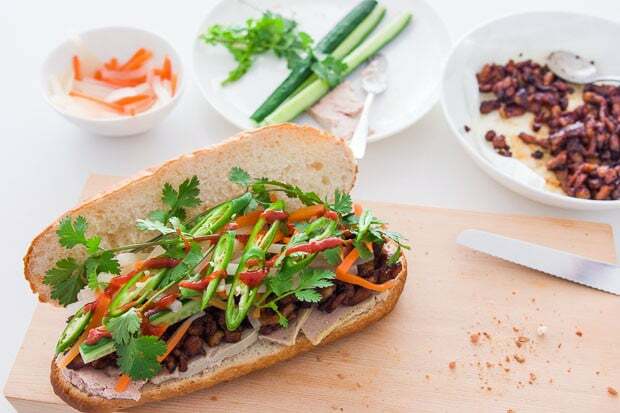 While I’ll never say “no” to a banh mi of any variety, my favorite will always be the first banh mi I had: Bánh Mì Thịt Xá Xíu, wherein the meat is Chinese-style barbecued pork (a.k.a. char siu), accompanied by a smear of pate, loads of sweet and sour pickles, crisp cucumbers, cilantro and spicy green chilies. It’s the quintessence of my perfect sandwich with a sublime balance of savory, sweet, sour, and umami and just a hint of smoky bitterness from the grilled pork. Texture wise, your mouth will never grow bored, with subtle shades of crisp, crunchy, creamy and chewy coming together in varying proportions in each bite. Similarly the variety of flavors makes for a well-tuned orchestra of combinations from refreshingly spicy and herbal to rich and intensely meaty. So if Bánh Mì Thịt Xá Xíu is my favorite sandwich ever, “why have I waited so long to post a recipe?” you ask. Well, I suppose it all comes down to laziness, but I blame the xa xiu. Between the marinating and the roasting, the xa xiu takes about two days to make, thus defeating the whole point of making a sandwich. But living in Japan, where I haven’t been able to find a good Vietnamese restaurant, much less a place that serves a decent banh mi, I decided something needed to be done to take the edge off of my cravings. Luckily, there’s an easy fix for making xa xiu faster: just chop the meat up. This not only makes it easier to eat, but it also makes it marinate and cook faster. Best of all, you can “grill” it in a frying pan, which means it only takes about five minutes to have this gloriously caramelized pork that’s redolent of garlic and five spice ready to stuff your banh mi. One of my favorite parts of xa xiu is the ultra-flavorful chewy bits that border on crisp around the edges, and using this method, 100% of your meat will end up like this. 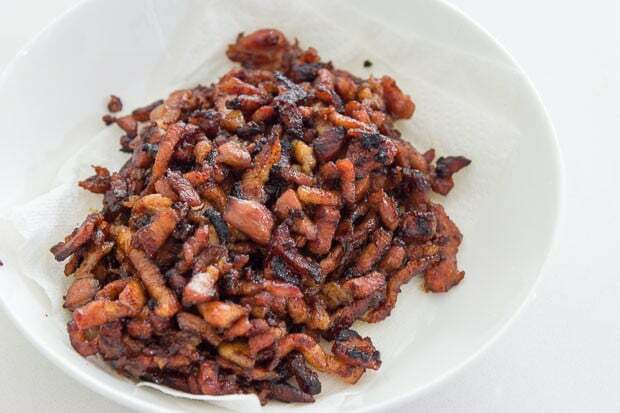 The trick is to use pork belly and to slowly caramelize it, allowing most of the fat to render out so that the meat fries in its own fat, just like frying bacon. As for the bread, I prefer using cheap “french bread” from the supermarket instead of a proper French baguette for banh mi. That’s because cheaper bread tends to be less dense, with a pillowy center and a crust that is more crispy than crunchy. Just be sure to toast the whole thing before filling it so the crust is extra crisp. As for mayonnaise, I’m not a big on mayo in any sandwich, and for me, a banh mi gets plenty of creaminess from the pate, which is why I nix the mayo. If mayo’s your thing, feel free to slather away. 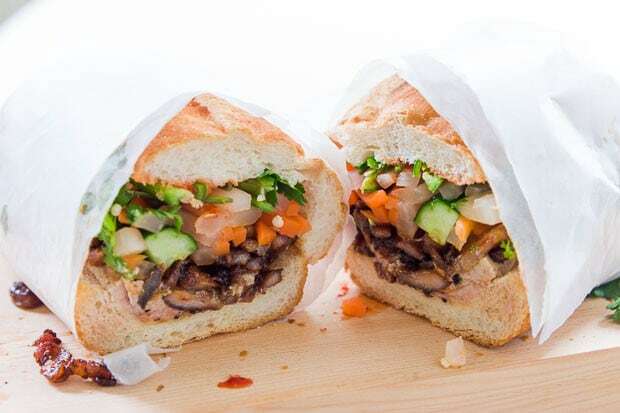 Likewise, the filling materials are merely a guideline to get you going down the path to find your perfect banh mi, so feel free to substitute and improvise. 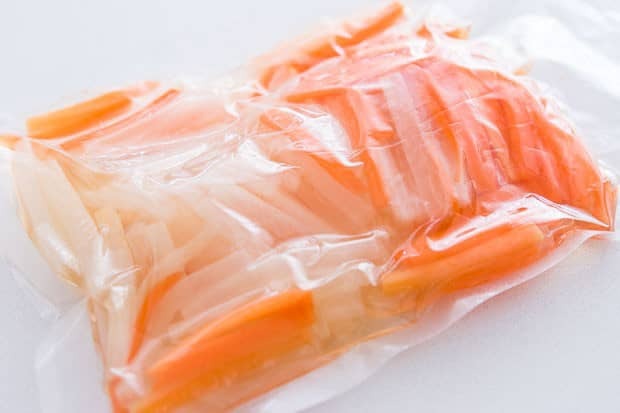 To make the pickles, put the julienned daikon and carrots in a sealable bag and add the sugar, vinegar, and fish sauce. Press out as much air as you can and then seal the bag. Massage the vegetables through the bag to accelerate the pickling process, otherwise you can prepare these a day in advance. 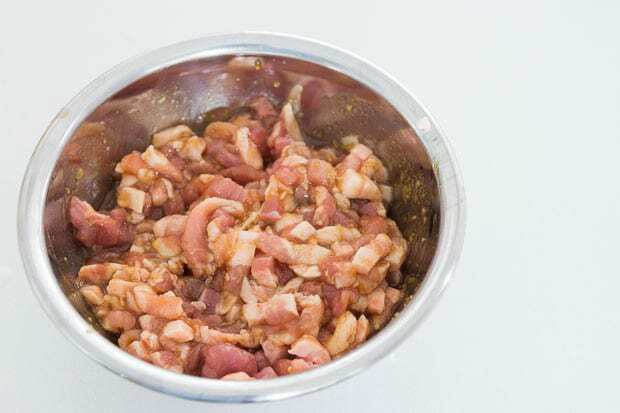 Put the pork in a bowl along with the five spice powder, honey, Shaoxing wine, hoisin sauce, fish sauce and garlic. Stir well to combine. Add the pork in a single layer to a large room temperature non-stick frying pan and turn the stove on to medium heat. 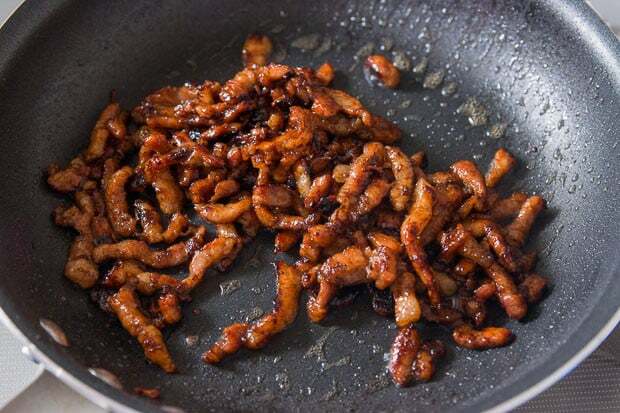 Fry the meat on one side until browned on that side and then stir fry, keeping the meat moving around the pan continuously to keep it from burning. It's done when the sauce has reached a dark caramel color and most of the fat has rendered out from the pork. Use tongs to transfer the pork to a paper towel lined plate, leaving as much of the oil behind in the pan as possible. To assemble the banh mi, toast the bread in the oven until it's warmed through and the outside is crisp. Slice the bread in half, leaving a bit of crust on one side intact to act as a hinge. Spread some Pâté onto the bread and top with the xa xiu, cucumber, pickles, chiles, and cilantro. Serve with Sriracha. If you want to overstuff your banh mi, you can scrape out some of the inside of the bread to make room for the filling. Hey Marc, do you buy five spice or do you make your own? What kind of pate are you using? What a brilliant idea of chopping up the pork belly! Thank you Marc! Just some pate from a deli counter. This one was’t really spreadable, but I usually like using the kind you can spread. I have a recipe for 5 spice you can look up using the search box, but I have 3 bottles of 5 spice from various work projects that I need to use so I’ve been using the bottled kind recently. 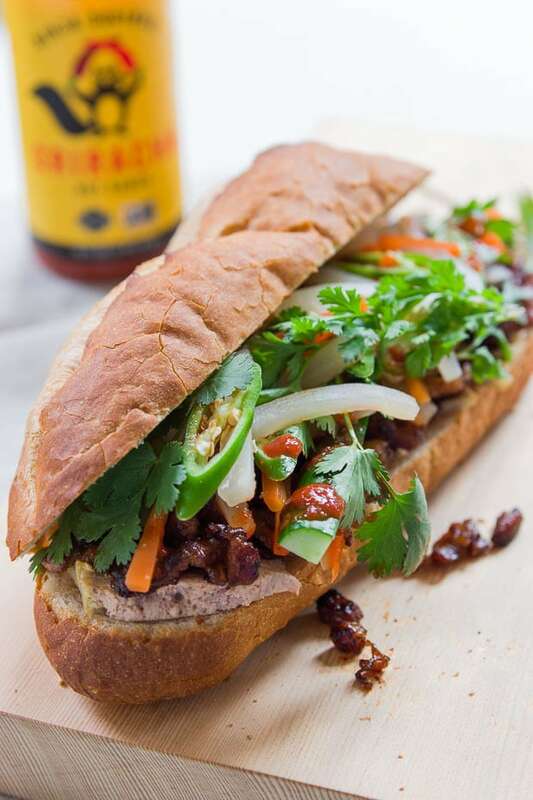 Bolillo–my favorite go-to for homemade banh mi!